We know you have many choices when choosing a Dentist in Richfield , OH so we have made requesting an appointment a simple process via our Web site. If, for any reason you cannot keep a scheduled appointment, or will be delayed, please call us as soon as possible. We accept most traditional insurance plans, contact our office to verify acceptance of your plan. Richard J. Gromofsky, DDS does not participate in Health Management Organizations; however, we will be happy to file your insurance claims for you. We accept checks, cash or credit cards. We also offer a flexible payment plan. Please see our Financial Coordinator for details. We are happy to file insurance for your reimbursement as long as you are free to choose your own dentist. Open Dental is our practice software which integrates both clinical and managerial applications to streamline and expedite patient care. 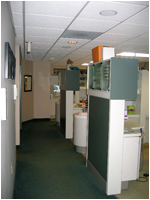 We utilize intra-oral cameras to assist in co-diagnose of dental disease as well as viewing dental health. We use digital photography for reviewing findings and pre and post treatment consultations. We use the latest cavity diagnostic tool, the Diagnodent which passes a small harmless and painless laser light through the tooth measuring changes in the enamel enabling us to diagnosis and treat cavities when they are very small. We can whiten your teeth with Zoom! our in office light whitening technique. In a little over an hour and a half we can whiten and brighten your teeth up to 10 shades! We can also make custom whitening trays for at home applications of whitening gels. We use a DVD based patient education system called CAESY. This program enables us to discuss with pictures and video virtually any pertinent topic in the field of dentistry. This assists our patients in making informed dental health decisions.